The next time you’re frantically late for your JetBlue flight, take a moment, when your Uber pulls up at JFK’s Terminal 5, to stop and smell the potato plants growing by the curb. 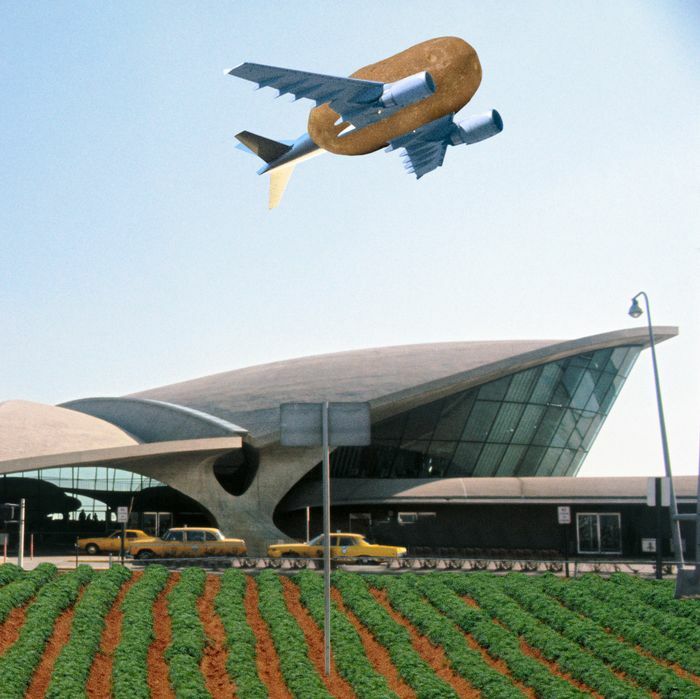 That’s right: There’s now a potato farm right there at the airport! They’re blue potatoes, of course. The 24,000-square-foot urban garden is adjacent to Eero Saarinen’s swooping 1962 TWA terminal, which is to become a 505-room hotel. It consists of 2,300 plastic milk crates, bolted to each other and to the ground. It will grow upward of 1,000 pounds of blue potatoes per harvest along with a cornucopia of produce like beets, mint, arugula, and basil — crops designed to not attract birds, which are dangerous at airports since they don’t mix well with airplanes. “An airport seems like an unexpected place for a farming experiment, but what better way to explore our role in the food cycle than to harvest right in our own back yard at JFK,” JetBlue’s Sophia Mendelsohn told DNAinfo. But is it a move toward self-sufficiency? Earlier this year the airport revealed details on its scheme for keeping animals. The Ark will be a 178,000-square-foot facility that will be equipped to keep everything from horses to penguins. The plan is that it will provide ingredients to T5’s restaurants, be a source for donations for local food pantries, and possibly be used for those Terra Blues potato chips you can get as a snack on most JetBlue flights. Just don’t stop and pick a tuber to snack on: Uncooked potatoes are indigestible, so eating them will give you terrible gas, which nobody wants on an airplane.